Welcome to the River Trail cottage! With five bedrooms and three and a half bathrooms this cottage is your ideal family getaway allowing for lots of room. On the main floor enjoy a large great room and a spacious dining room overlooking the Muskoka River and the Wilson's Falls. With a well equipped kitchen you'll be all set to enjoy large family feasts! A large deck offering plenty of seating you will truly love soaking in the surrounding nature while hearing the sounds of the falls. Also on the deck is a patio set for dining as well as a barbecue. The master bedroom features a king size bed and it's own ensuite. The two bedrooms on the main floor share a full bath. There's also a powder room on the main floor as well as laundry facilities. Enjoy a screened in Muskoka room with a hot tub and lounge seating. The party continues into the basement with another seating area with a TV for entertaining. The pool table, foosball table and wet bar a hit with many! The basement features another full bathroom that will be shared by the two bedrooms. One bedroom features two queen beds while the other features two twin beds. Enjoy sitting on the dock, jumping into the river for a great swim or fishing! We provide a canoe that you can use to explore the river. Across the river is the stunning Wilsons Falls trail which you can walk and spend the day appreciating the beauty Mother Nature has provided. This cottage features Geothermal heating and cooling. This is a family cottage. Majority of renters must be over 25 years of age and responsible. List of renters will be asked for in advance. No pets permitted at the time being. Exceptions can be made - please email for inquiry. No smoking anywhere inside cottage or Muskoka room. Bath towels and bed linens will be provided. Towels are meant for indoor use only. Renters to bring own beach towels. Extraordinary Winter getaway, at breathtaking view! 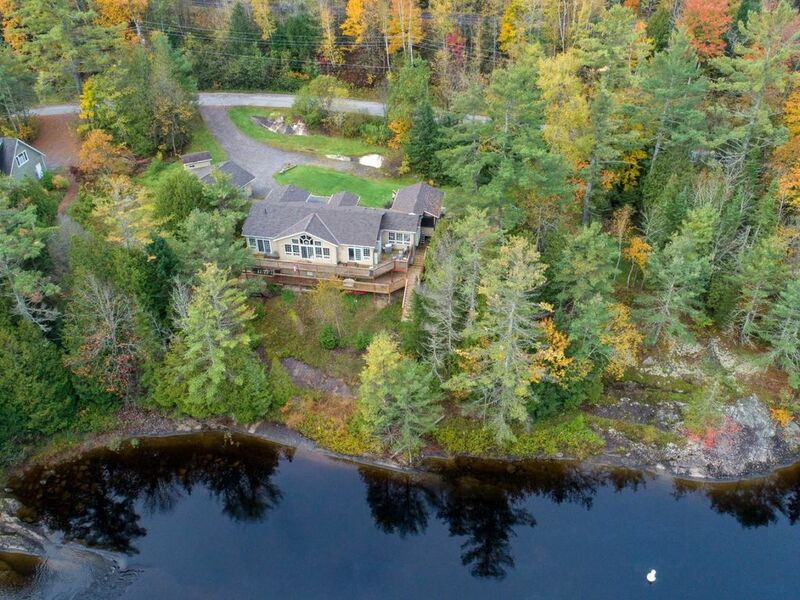 Really nice and luxury cottage with unobstructed great view of the river and woods! Very clean cottage with fully stocked dishes, appliances and a well kept hot tub in a nice patio, BBQ, pool table and everything we needed to accomodate and entertain ourselves! WiFi, TV for kids with all possible chanels and worked great in main and second floor. There is a fairly large playground area for kids to do sliding, make snowman and have fun!. Would be a fantastic place to stay with kids! A fire pits at bottom of the cottage by river with a view of fall. We didn't allow kids near water for safety. But I imagine would be nice in summer! With five minutes drive there is grocery store nearby, so you can pick up whatever food items you need after. Owner Shima was very nice and responsive! We would have stayed longer and love to come back in summer as well, and definitely recommend a stay at this cottage in Brecbridge! We were an extended family of 6 adults and 3 kids ages 4 and under. The place was large and comfortable and ideally located. The views were stunning and it had most of the amenities (at and around the house) we required. The only thing I’d say is to pack an extra sweater and something warm for your feet - the place was a bit on the cooler side. Owner was also easily accessible and responsive. We would definitely stay there again!